NCERT has dropped three chapters—“Clothing: A Social History”, “History and Sport: The Story of Cricket”, “Peasants and Farmers”— from the Class 9 history textbook, titled India and the Contemporary World – I.
Orijit Sen’s work, based on a village tale, of a woman named Nangeli, who is believed to have cut off her breasts in an effort to protest the caste-based mulakkaram. In December 2016, as part of a curriculum rationalisation exercise initiated under the BJP government, the Central Board of Secondary Education (CBSE) issued a circular to all its affiliated schools informing them that the section 'Caste Conflict and Dress Change' “stands omitted from the curriculum and no questions from this section should be asked in 2017”. However, according to a report in the Indian Express, this section remained part of the textbook – until the second textbook review was carried out, after which, NCERT has dropped three chapters—“Clothing: A Social History”, “History and Sport: The Story of Cricket”, “Peasants and Farmers”— from the Class 9 history textbook, titled India and the Contemporary World – I. One of the removed sections of the textbook discusses the Nadar (also called Channar) community of Travancore—an Indian kingdom from 1500-1949. The Nadar community live in both present day Tamil Nadu and Kerala. Clothing played an essential role in defining status quo at that time, and men and women of the Nadar community were forced to keep their upper bodies uncovered by the caste council of the Nair community of the state of Travancore in the early 1800s. 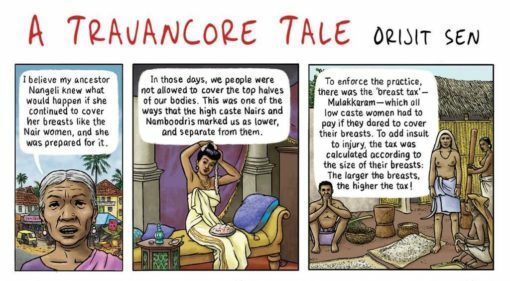 If they chose to cover themselves, they were forced to pay mulakkaram or “breast tax”, which was assessed on the basis of the size of a woman’s breasts. In 1822, the practice sparked violent agitations causing the Channar Revolt, where women from the Nadar and Ezhava communities demanded the right to wear the same clothing as “upper” caste women. 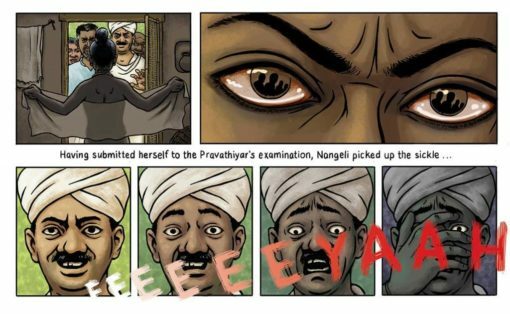 In these times, when the government is altering and re-writing history for political gains and taking away the opportunity to learn objective history in classrooms, let us recall one of Orijit Sen’s work, based on a village tale, of a woman named Nangeli who is believed to have cut off her breasts in an effort to protest the caste-based mulakkaram.